The author, up to his elbows in bait. No, I am not a fisherman. Originally I am from Vermont. 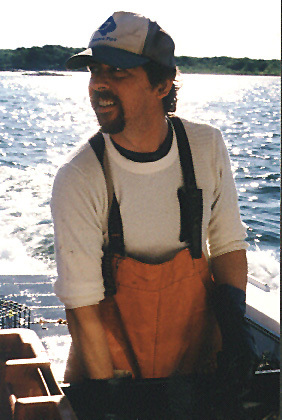 I moved to New Hampshire in 1995 where I work as a software engineer, but I have always been interested in the sea, the creatures it harbors, and the people who make their livelihood from it. Being from Vermont, I know a little about farming and, oddly enough, I think independant full time fishermen and farmers are cut from the same cloth. Both are at the mercy of nature, which ultimately dictates their success or failure from year to year. They must, therefore, accept a certain amount of risk from potentially devastating factors that are beyond their control. To me this takes a certain kind of courage. Both work long hours almost everyday, in all kinds of weather, at hazardous jobs (accidents involving farm machinery are frequent, almost always cause severe mutilation, and often are fatal). Moreover, the responsible ones always seem to have in the back of their mind the notion of giving something back after the harvest....a sense of conservation to help ensure that the cycle continues. I think this is based on more than just trying to ensure a good harvest in the following year but also, and more importantly, it is based on a respect for the land (or sea) and that which is taken from it. Sometimes it seems that while some folks are busy picking the ecological 'cause of the day' and aligning themselves with their chosen rhetoric, it is the independant farmer and fisherman who are among those who actually put conservation into practice. In the wee hours of the morning while we sleep, they are quietly, without media coverage, and sometimes without funding (or legislation telling them to do it), either planning or perpetrating acts of conservation. I met Phil through a friend in the spring of 1997 when he offered to take us out with him for a day. Since then, I try to go out as often as I can and hope to do so for as long as he'll tolerate me. I built this site in response to a comment he once made that there is so little the public knows about his line of work. He has been a full time fisherman for about 30 years and is a natural teacher. He has been of great help in putting this site together. My thanks to him and his crew.